The first comprehensive look at how politicians let the entertainment industry bilk taxpayers, hijack public policy, and hurt economic investment, starting and ending with Trump. From stadiums and movie productions to casinos and mega-malls to convention centers and hotels, cities and states have paid out billions of dollars in tax breaks, subsidies, and grants to the world's corporate titans. They hope to boost their economies, create new and better jobs, and lure well-known events such as the Super Bowl - not to mention give their officials the chance to meet celebrities. That big entertainment drives bigger economies is a myth, however. Overwhelming evidence shows catering public policy to its promises results in a raw deal for the taxpaying public. 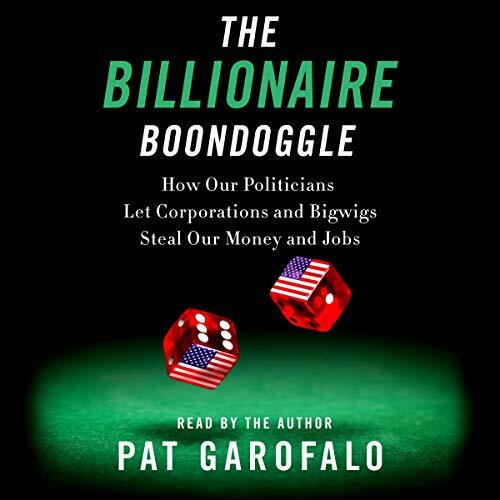 In The Billionaire Boondoggle, Garofalo takes listeners on a tour of publicly subsidized corporate America to explain how that myth came to be, how much money America's elected officials throw away, and why courting big entertainment just courts disaster. You’ll learn how Maryland gave millions of dollars to Netflix to make House of Cards and Nevada spent hundreds of millions on a new home for the NFL’s Raiders. New Mexico paid big money to host The Avengers, while city after city fell prey to the debt trap that is the Olympics. You’ll see how big sporting-goods stores like Bass Pro Shops and big casinos across the country all get in on the subsidy scam. And you’ll see how many cities got in bed with hotel titans, including Donald J. Trump himself. This audiobook is the go-to guide for the many ways in which American taxpayers unknowingly subsidize the TV shows they watch, the sports teams they root for, and the hotels they sleep in, all based on an economic theory that only adds up for CEOs and bigwigs.